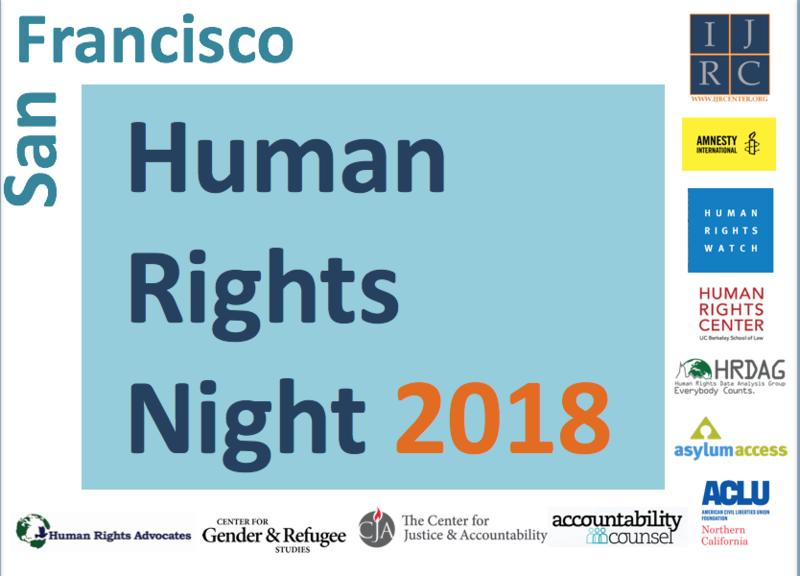 Join us on the evening of December 12, 2018 for the seventh annual San Francisco Human Rights Night. We’ll gather again to reflect on the the highs and lows for human rights in 2018, raise a glass to the 70th anniversary of the Universal Declaration of Human Rights, and catch up with friends and colleagues from around the Bay Area. There will be a fantastic silent auction, human rights updates, drinks, and appetizers. Amnesty International will provide a Write for Rights station for writing and signing letters for human rights defenders at risk. Please share the flyer with friends. Please RSVP to attend using the form below. We look forward to seeing you! Thank you to Accountability Counsel, ACLU of Northern California, Amnesty International, Asylum Access, the Center for Gender & Refugee Studies, Center for Justice & Accountability, Human Rights Advocates, Human Rights Center at Berkeley Law, Human Rights Data Analysis Group, and Human Rights Watch for their co-sponsorship.